We know our clients are happier, and their members get more satisifaction from the website, when we provide top notch support. That's why we assign every new client a personal website designer who will help them set up the website, learn our features and answer questions. Club Membership Software Specially For...Clubs! With our website-based club software, we help clubs run more efficiently through improved processes and automation. Club members can perform many tasks online such as updating their profile, pay their account balance and read the latest announcements. Administrators can use our club membership software to send mass text messages and emails to its members. This helps keep all club members in the loop. Members can also RSVP for an event, complete surveys and interact on the message board. What Is Club Membership Software? Club Membership Software simplifies club administration by integrating payment processing, automatic billing, membership management and features that encourage club members to interact with one another. Because our club software is website based, there is nothing to install nor a risk of losing information on your computer. Administrators spend less time on their repetitive tasks by using our configurable rules and settings that are both robust and user friendly. When a member's membership is coming up for renewal, the website automatically sends reminder emails and generates an invoice. The member can visit the website to view their transactions, their open account balance and make a payment directly through the website. Members can also use our club membership software to register for events. 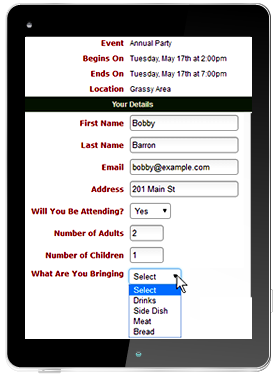 Our RSVP feature allows for custom questions, registration limits and attendance roster. This makes life easy for administrators by allowing club members to register through your website and have the website automatically enforce the registration rules. Let us simplify your life and increase your members' satisfaction with Club Membership Software by Membership Space. Take a tour and send us any questions. Our comprehensive list of features are designed to give clubs the tools to grow their membership and increase member satisfaction. Our web-based club software also improves communication through mass emails and text messaging. Members can register for membership, receive renewal notifications and make online payments through the website. Our membership profile feature keeps club records in a central location with custom profile fields and many options to configure which information is required and where it is displayed. Members are more engaged by registering for events, viewing announcements, uploading photos to their profile and responding to surveys. Administrators are more organized by storing documents in folders, viewing reports, receiving automatic email notifications and configuring membership rules. Members can view upcoming events and indicate if they are or are not attending each event. When a member logs into the website, they can be shown their current account balance. Several of our features help administrators post and organize announcements on the website. Keep members informed by sending them mass emails that can contain text, images and links. Each member's profile details can be shown in the online directory plus privacy options. 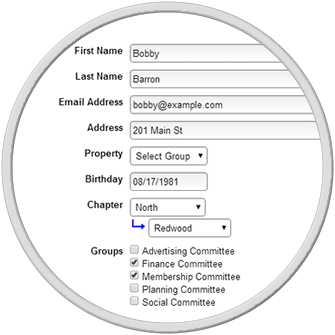 Easily control the information stored on each member through custom profile fields. Does your club membership feel like members of your club? Many clubs struggle with how to keep operational costs low and member satisfaction high. A website with software features specific for clubs is a great solution for both of these concerns. Our club membership software helps administrators keep all members informed. Group messages can be sent via email or text message directly through the website. This is a big benefit when a meeting is changed, an item is lost or there is an announcement that is important for every member to read. Email messages can also be saved so that they can be used and modified in the future. Clubs also like to keep their upcoming events organized by using our calendar feature. Individual events can be assigned to a category so that members can more easily find the events they are interested in. The calendar can also be populated with recurring event logic based on nearly any scenario. Group messages and the calendar are great pieces of our software that keep your club membership feeling like they are part of the club. But, a website would not be complete unless it has the ability to accept payments. Club members are able to visit the website, view their account balance and make a payment directly through the website. No external websites that members have to log into. Club members can also view their historical transactions, invoices, adjustments, payments and refunds. This increases member satisfaction and reduces the workload of administrators. The website also automatically informs club members when their membership dues are coming up for renewal. An administrator configures up to 5 custom email messages that can be scheduled to be automatically sent a set number of days before or after the member's membership renewal date. Membership profiles are also a way to keep everybody feeling like they are a member of your club. Each member has their own profile which includes photos, custom fields and the ability for fields to be for administrator use only. These profiles also feed our directory feature which allows members to look up the details of other members. Members can also create albums and upload photos to their profile. Member self-service enables members to change their own profile information based on the rules configured by an administrator. Each time a member changes their profile details, an email message is sent to an administrator(s) showing the old data vs the new data. Members can also carry your club's website with them in their pocket. 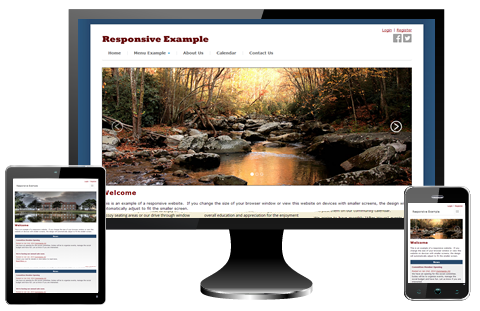 Our mobile friendly websites automatically resize based on the screen size of the visitor's device. This makes it easy for your club membership to check out the website when it's most convenient for them. Visit our online tour to discover more about how our club membership software can help your organization and its members. Since 2001, we have been helping association leaders more efficiently manage their day-to-day responsibilities and increase member satisfaction. Our club management software automates common tasks and gives associations the tools, reporting and support they need.